José Feliciano will remain forever celebrated for his perennial Christmas classic "Feliz Navidad," one of his many hit recordings that have resulted in 45 Gold and Platinum records and eight Grammy awards. His launch to stardom began 50 years ago, with his hit 1968 recording of "Light My Fire," but it was not until his appearance at a baseball game later that fall that he truly became a household name. In 1967 this guitar was custom built for José Feliciano. On it, he recorded his first hit in 1968, "Light My Fire," and performed before Game 5 of the 1968 World Series. 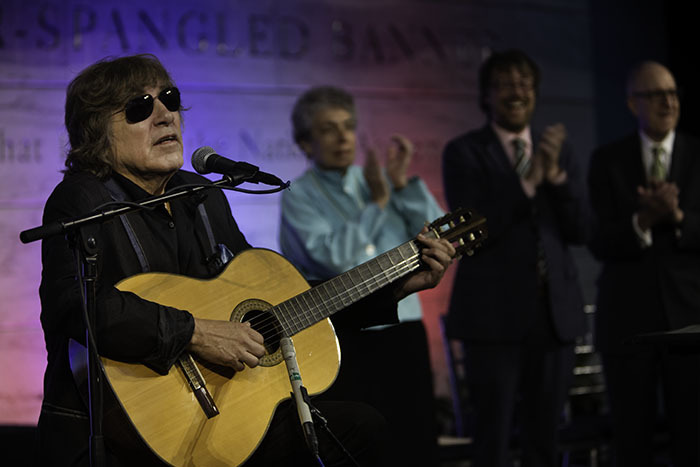 In 2018, Jose Feliciano welcomed new citizens into the United States during a naturalization ceremony hosted by the National Museum of American History. Indeed, his early life in Lares, Puerto Rico, and then in New York City, where his family moved when he was five, conjured for him spectacular visions of the brilliant traditions of American music, song, and . . . baseball. So when he was asked to perform "The Star-Spangled Banner" before Game 5 of the 1968 World Series at Detroit's Tiger Stadium, he crafted the most beautiful, and meaningful, rendition that he could imagine. He was only 23 at the time, and his interpretation of the anthem was unexpected, new, different, and vital. It was soulful and searching. Steeped in blues and folk music traditions and seasoned with the percolation of his fingers across a guitar built in the Sunset Boulevard shop of an immigrant family from Torreon, Mexico, his rendition demonstrated the complexity of the American experience as none had before. The live national broadcast of his youthful and pleading, yet unorthodox, performance reverberated throughout a country embroiled in the Vietnam War, reeling over the assassinations of Dr. Martin Luther King Jr. and Robert Kennedy, and recovering from the previous summer's civil uprisings in cities throughout the country, including Detroit. Some were offended by the way he made the song his own. They believed that performances of the anthem should be delivered with the solemn pomp and circumstance of marshal music, rather than incorporate the instruments, vocal inflections, and musical styles found in the more popular genres of the day. They considered Feliciano's version not as heartfelt and sincere, but as an attack on authority and tradition. The day after the game, the Los Angeles Times reported that NBC had "received a rash of calls from irate viewers." One spectator at the game called it "a disgrace, an insult. I’m going to write my senator about it." Another, also quoted in the Los Angeles Times, called it "non-patriotic." Feliciano heard boos from many in the crowd, and stood his ground while interviewed during the event: "I just do my thing—what I feel. . . . I love this country very much. I'm for everything this country stands for." Others supported him and, through their embrace, Feliciano sent "The Star-Spangled Banner" into the pop charts for the first time ever. As Bill Freehan of the Detroit Tigers put it after the game, Feliciano made Marvin Gaye, who sang the anthem in a conventional manner before Game 4, "sound like a square." The attention that he drew from the performance launched a revolution through the present day for popular artists, from Jimi Hendrix to Whitney Houston to Lady Gaga, to personalize and seek new ways to find meaning in the anthem. We continue to place great weight in the ritual singing of "The Star-Spangled Banner" at sporting events—both as an opportunity to express thanks for the sacrifices of those before us, and, through solemn protest, to challenge the country to do better, to continue our march toward a more perfect union. It was Feliciano's 1968 performance, however, that led the way for us all to search and explore together how and why "The Star-Spangled Banner" matters. Following his keynote address, delivered just a few feet from the flag from Fort McHenry that inspired the anthem, Feliciano performed "The Star-Spangled Banner" on his 1967 Candelas guitar, just as he performed it during the 1968 World Series. You can also find this video on YouTube. 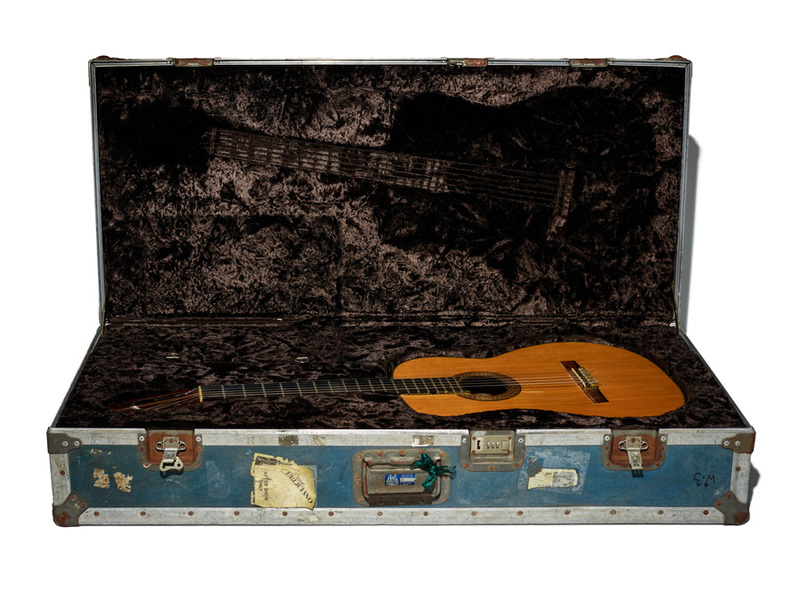 José Feliciano has donated a set of objects to the National Museum of American History that each speak to different facets of his life and career. The objects include the braillewriter that he has used since the 1960s to write lyrics, notes to fans, and love letters to his wife, Susan, who joined us at the donation ceremony on Flag Day. 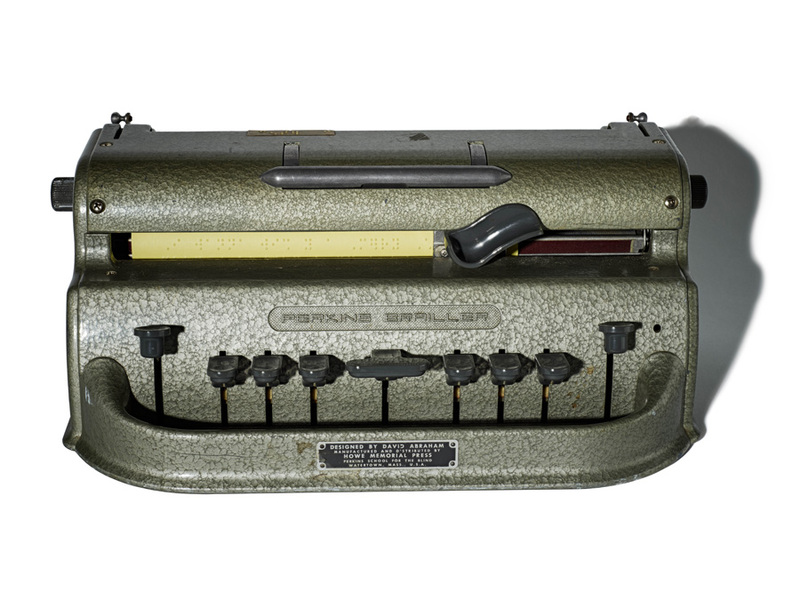 Feliciano has been blind since birth, and his braillewriter was a critical songwriting tool that also contributes magnificently to the museum's growing collection of objects that convey the stories of Americans who are blind. 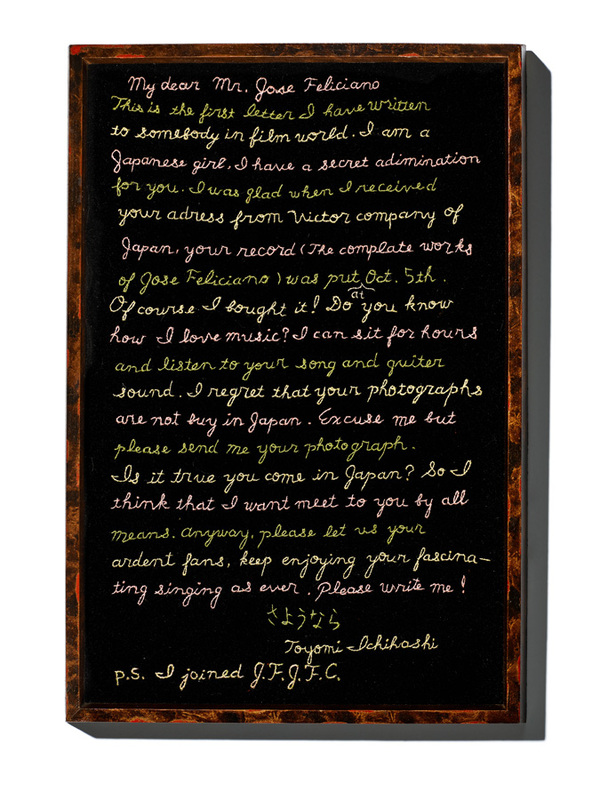 This letter was embroidered and mailed to Feliciano in the early 1970s by a member of Japan's José Feliciano Fan Club. Feliciano talks about the guitar he donated to our collections. This video is also available on YouTube. Three objects now in our collection represent the extent of his global reach: a pair of his iconic sunglasses, the likes of which have featured on millions of album covers and concert posters throughout both hemispheres; a long-used performance stool that has journeyed with him to concert halls and recording studios all over the world; and a cherished letter from the early 1970s that had hung in his home studio for years—a piece of fan mail embroidered with a message in English from a member of Japan's José Feliciano Fan Club that demonstrates not only the breadth of his global appeal, but also the intense dedication of his fans. Finally, he donated his beloved 1967 Candelas guitar—the guitar that was built specifically for him by famed Mexican American instrument-maker Candelario Delgado. 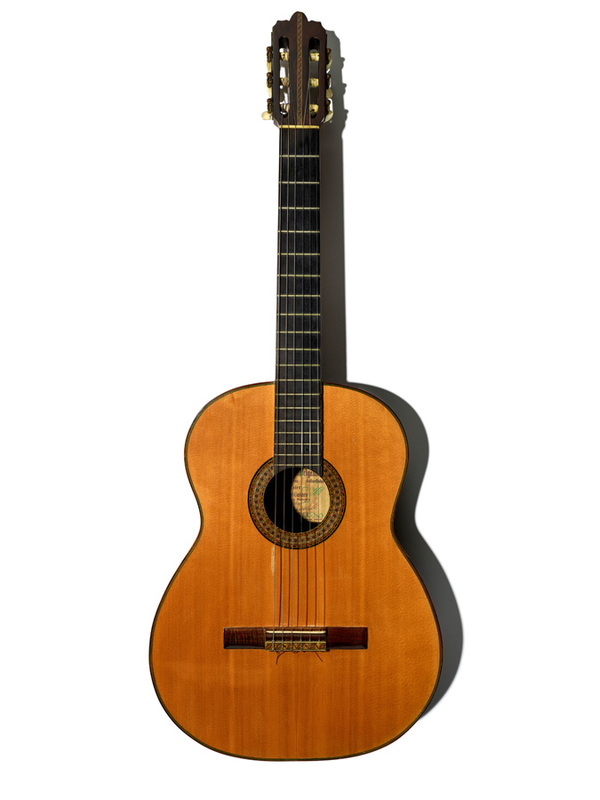 With this guitar, Feliciano recorded his first hit, "Light My Fire." And with this guitar he provided the world that historic 1968 performance of the national anthem. During a naturalization ceremony in Flag Hall, Feliciano performed "The Star Spangled Banner" on this 1967 Concerto Candelas guitar before donating it to the National Museum of American History. John Troutman is Curator of American Music in the Division of Culture and the Arts. He has also blogged about the legacies of James Cotton and Chuck Berry.